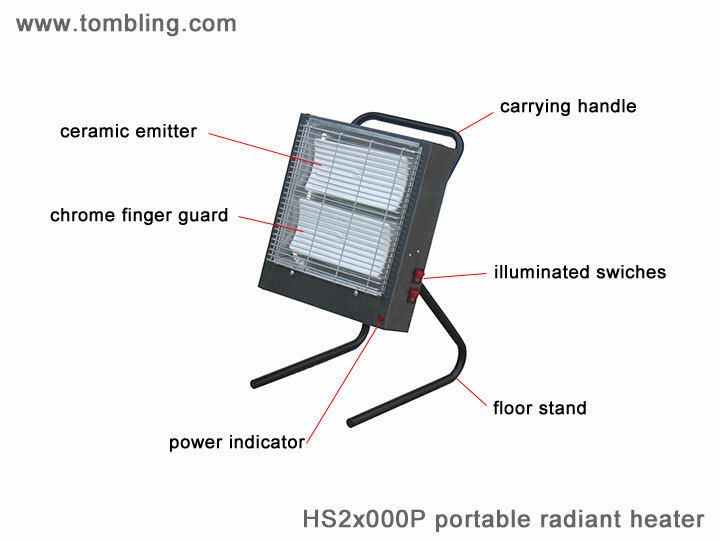 The HC3000P 3000w portable infra red heater, is a lightweight (6Kg) compact heater that is easily moved from place to place. It plugs into a standard UK 13A 230V 3 pin socket (BS1363) to provide instant heating in commercial and industrial buildings such as trade counters, workshops, factories, warehouses, etc. Unlike portable quartz halogen heaters it doesn't emit a bright harsh glare (it doesn't produce any visible light at all!). Making it perfect for photographic studios, production areas where accurate colour rendering is important, or just where the glare of halogen tubes would be irritating. The HS3000P produces a focused beam of infra red heat which directly heats the people and objects it strikes, without heating the surrounding air. Making it an economical way to heat workers in large, open, or drafty areas. To minimise the risk of fire, the HS3000P will only operate when it is in an upright position. If it is knocked over, or used at an angle, twin built in tilt switches will immediately turn the heater off. To protect users from burns the heater has bright metal finger guards fitted in front of the ceramic emitters. If animals or children are present we recommend the use of a fire guard. Ceramic emitters, can withstand the knocks, vibration, and splashes that portable heaters inevitably suffer. Unlike quartz halogen glass lamps , they will not shatter and are far less likely to break. The lifespan of ceramic emitters is measured in years, while an infra red lamp typically lasts 5000 hours. They emit medium wave infra red which is does not feel as fierce as the short wave infra red produced by quartz halogen lamps. Activair portable infra red heaters are fully approved to BS EN 60335-2-30 and are CE marked. 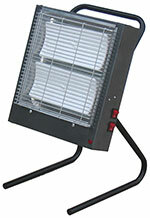 Activair portable radiant heaters are suitable for use in the UK, most of Europe, Eastern Europe and the Middle East. They are supplied with a standard 13A UK plug, but can also be supplied with a 230V 16A 3 pin BS4343 industrial plug. 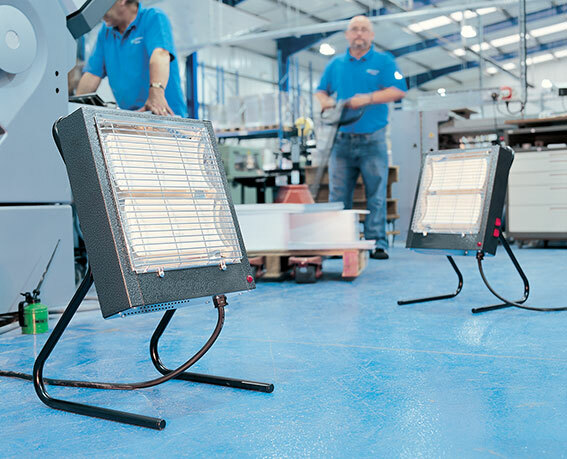 Activair portable radiant heaters are manufactured to the highest standards, and we are confident that they are completely reliable. However, in the unlikely event a fault may occur, they have a full 1 year return to base parts and labour guarantee. With no glare, tough long lasting ceramic emitters and built in safety cut-outs, the HC3000P portable infra red ceramic heater is a very versatile and safe infra red heater. Because it heats people and objects directly without heating the surrounding air, it is an economical way to keep people warm in difficult or expensive to heat areas. Mobile infra-red heaters - infra-red heaters on wheels. to tell a friend or colleague about it. Copyright � 2008/10, W. Tombling Ltd.